Since the launch of its peripherals, Corsair has been doing extremely well. But even they know that there's only so much you can do with a keyboard. So at this year's CES 2014 we are getting an update to the amazing Vengeance K70 mechanical gaming keyboard. But not just any update. In partnership with the people who make the clicky switches we love (Cherry), Corsair is bringing their mechanical keyboards something new with the Cherry MX RGB key-switches. The MX RGB Project has a simple goal that Corsair has not achieved with 100% mechanical key switches which is both per key lighting and control of 16.8 million color options. Ok, maybe that was a "simple" in my head. Either way it is done and being shown off right now at CES 2014 as you read this. You want to highlight your macro keys in a different color so you can figure which one you need at a glance; or maybe you just want to have the WASD in a cobalt blue while everything else is in red? Whatever you want to do with the lights is now up to you. In fact, with this new technology, you can even have your name scroll across your keyboard and more. We have seen per key lighting with multiple colors before, but never housed in something as awesome as the Corsair Vengeance K70. The new keyboards will be available in several Cherry switch types: super-fast Cherry MX Red, the light tactile feedback of Cherry MX Brown, or the tactile and audible feedback provided by Cherry MX Blue. 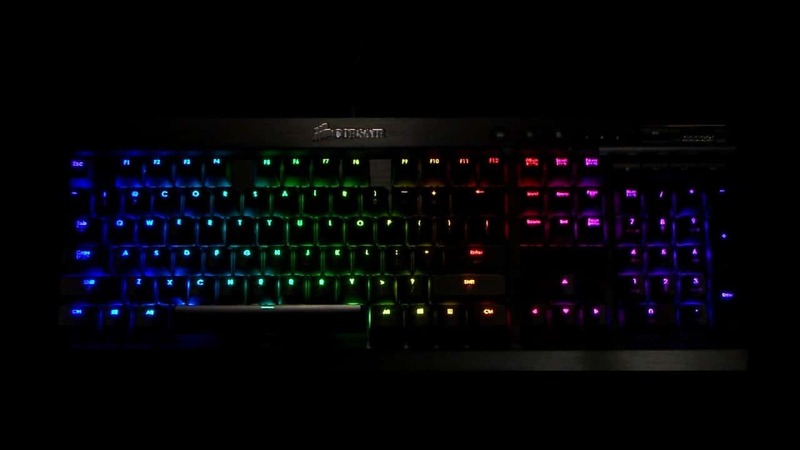 The MX RGB Project: 100% mechanical key-switches with per-key 16.8 million color back-lighting in the most amazing gaming keyboard you've ever seen. At CES 2014, California-based Corsair and Germany-based Cherry Corp. are debuting the “MX RGB Project” gaming keyboard. The technology showcase , based on a Vengeance K70 gaming keyboard fitted with new Cherry MX RGB key-switches, gives gamers a first look at the vast customization and game enhancing benefits of per-key 16.8 million color back-lighting. In the second half of 2014, Corsair will bring the concept to life by launching the world’s first Cherry MX RGB-based gaming keyboards. The new keyboards promise to give gamers all of the precision, feel, and reliability of Cherry MX-based Corsair gaming keyboards enhanced with new personalization and gaming customization provided by nearly limitless per-key lighting combinations. The new keyboards will be available in several Cherry switch types: super-fast Cherry MX Red, the light tactile feedback of Cherry MX Brown, or the tactile and audible feedback provided by Cherry MX Blue.